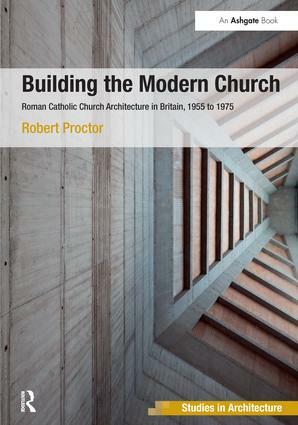 Fifty years after the Second Vatican Council, architectural historian Robert Proctor examines the transformations in British Roman Catholic church architecture that took place in the two decades surrounding this crucial event. Inspired by new thinking in theology and changing practices of worship, and by a growing acceptance of modern art and architecture, architects designed radical new forms of church building in a campaign of new buildings for new urban contexts. A focussed study of mid-twentieth century church architecture, Building the Modern Church considers how architects and clergy constructed the image and reality of the Church as an institution through its buildings. The author examines changing conceptions of tradition and modernity, and the development of a modern church architecture that drew from the ideas of the liturgical movement. The role of Catholic clergy as patrons of modern architecture and art and the changing attitudes of the Church and its architects to modernity are examined, explaining how different strands of post-war architecture were adopted in the field of ecclesiastical buildings. The church building’s social role in defining communities through rituals and symbols is also considered, together with the relationships between churches and modernist urban planning in new towns and suburbs. Case studies analysed in detail include significant buildings and architects that have remained little known until now. Based on meticulous historical research in primary sources, theoretically informed, fully referenced, and thoroughly illustrated, this book will be of interest to anyone concerned with the church architecture, art and theology of this period. Contents: Introduction; Tradition; Modern church architecture; Forms of modernism; Modern church art; Modernism and the liturgical movement; Liturgical change; Devotion; Ritual and community; The church and the world; Conclusion; Plans; Bibliography; Index. Dr Robert Proctor is Senior Lecturer on Architectural History & Theory at the University of Bath, UK.